When it comes to smoothies it seems like green gets all of the attention. Don’t get me wrong, I think a proper green smoothie is a sight to behold, but every once in a while, I want something lighter and brighter staring back at me in the morning. This drink features one of my favorite smoothie ingredients: fresh turmeric. Under a brown, papery skin, the root is a bright, deep orange and adds a distinctive yet subtle zing. Turmeric to me had always been just that yellow powder that I added to tofu scramble and mac-n-cheese – for flavor, sure, but mostly to get some color. Fresh turmeric has me hooked and though I have to go into OKC to the Asian market to get the fresh variety, it’s worth the trip and the price is right – $1 for about 10 root pieces. To be sure, the rhizomes are homely little cusses, but they are cancer-fighting powerhouses. The active ingredient in turmeric is the antioxidant curcumin that slows the replication of cancer cells and helps protect healthy cells from damage. Colon, prostate, lung and breast cancer rates are lower in India where turmeric is a part of the daily diet than here in the U.S. Grapefruit: detoxifying; contains naringenin which slows the growth of breast cancer cells; the peel contains d-limonene which may help in keeping pancreatic and colorectal cancers at bay. Orange: detoxifying; contains cancer-inhibiting flavonoids; the peel contains d-limonene which may help in fighting pancreatic and colorectal cancers. Carrots: rich in protective carotene that stimulates T-cell cytotoxic capabilities; protects the skin from sun damage; helps protect against lung, bladder, stomach, prostate and colon cancers. Bananas: high in potassium and low in sodium, they help reduce blood pressure and equalize blood sugar levels; there is some debate whether or not very ripe bananas with brown skin contain properties that protect cells from mutation. Better safe than sorry – eat your nanners. For an extra cancer-bashing boost, replace the water with chilled green tea – and by all means – add some kale in there if you like. Brighten even the gloomiest day with this powerhouse of a smoothie, flavor-packed with orange, ginger, grapefruit, carrots, mango, and turmeric. Add all ingredients to a blender and process until smooth. Tastiest served chilled. This looks awesome! I’ve been looking for some new ways to incorporate more turmeric into my diet, and this is a really exciting option! It’s the best! I just love the flavor. Annie! So cool! I also just learned that if you run turmeric (the powder) on unwanted hair, it helps get rid of it! Anyway, smoothie looks delicious – love your yummy and informative posts! Whoa – now that is a very interesting little piece of trivia, my friend. Am I going to test it out? Probably not :-). Haha. I know – you might lose the hair, but I’m pretty sure you’d be left with yellow skin. Pick your poison! It’s gorgeous. I kinda want to put it in everything now! Who could resist the title of this blog post? And the photos are gorgeous. A bit of sunshine is just what we need. I’ve never used fresh turmeric and am surprised by how cheap it is, I’ll have to look out for it. I was feeling very sunshiny when I wrote this post – – and agreed – – Bring on the sunshine! Mmmm I love tumeric! And can I just say I love the glasses too! Aren’t they great? I got them at a very cool (read: over-priced) store called Anthropologie. They have clothes and accessories, but I’m not interested in that stuff. It’s their home goods that I love. I’m sure you would totally dig it, too. This kind of sunshine is something I’m all up for – it looks refreshing and gorgeous! Gotta wake up those senses in the morning ;-)! Thank you! Some days the photos just work – despite my ineptitude! This looks absolutely beautiful! I’ve been adding turmeric to just about everything, so I will definitely have to try this! I was a bit slow to catch on to turmeric. Do you use fresh or mostly the powder? I’d be curious to know how else you use it. I’ve been hearing so much about fresh turmeric recently. Anti-cancer, anti-inflammatory super immune booster. Now I’ve got to high tail to my Asian Market! Gorgeous girl! Ahh yes a break from the classic green smoothie. This looks delishhh! I love the addition of the spices. Perfect for a tropical getaway! Now I just need a plane ticket! My bags are packed – where are we going ;-)?? I didn’t think about the yellow skin 😉 – yikes! Very interesting that your grandma used it to brush her teeth. Makes sense. Can’t wait to try this! I do agree that Green is Great, but sometimes you need something a little less forbidding. And this seems like just the thing. I’ll definitely get some fresh turmeric next time I see it! P.S. your blog post inspired me to write a blog post for my client Go Raw about cancer-fighting fruits to juice or blend. Thank you! Really?! How cool is that :-)! That’s right! Here’s the link, freshly posted just now. Thank you! Sunniest smoothie ever! This sounds amazing and delicious. 🙂 I’ve never used turmeric in a smoothie before–must try it! I was hesitant about adding something that I thought would have a very strong taste, but it’s really pleasant. I now add it to all of my smoothies. Oh wow! That is so cool, Nicole! Good growing :-)! Oh My this makes me so hungry/thirsty?? Thank you Ms. Anne. You’re a sweetheart! Thank you :-). I loved the 1st picture of the smoothies,… so tasty looking & sounding! 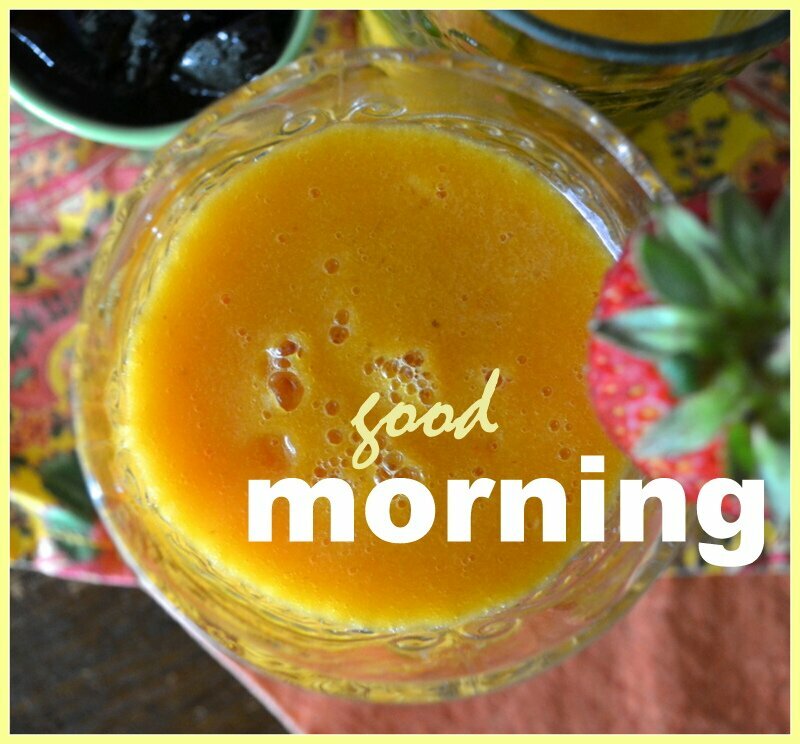 I love mango with ginger & to add carrots & turmeric too,…double waw! Did you use white or pink grapefruit in here, Annie? I must make these lovely ones soon! I used pink grapefruit in this, Sophie. They’re in season here right now and just wonderful. My “local” (2 hours away…) Whole Foods had it once, but haven’t seen it in a while. Maybe no one was buying it! 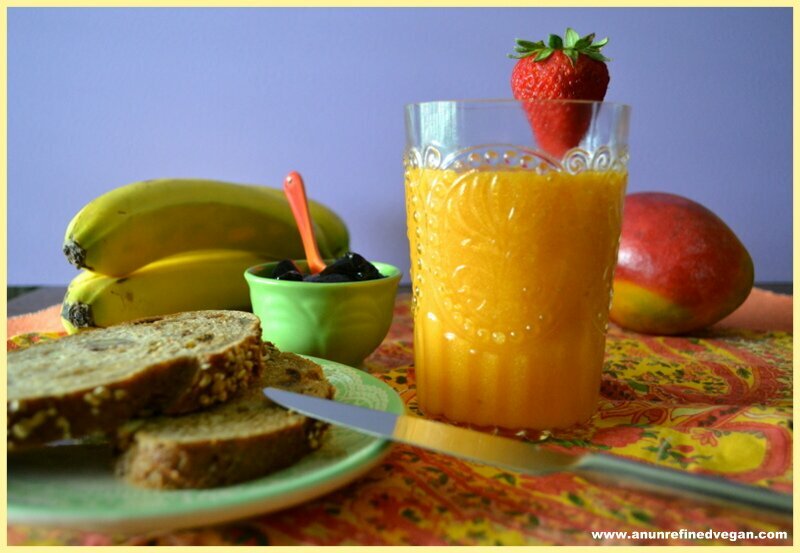 Looks delicious & turmeric is sooo good for you! I’m a little obsessed with it right now! This is really interesting – I’ve never used fresh turmeric before. I hope I can get it, because again – you have broken the mold for smoothies. This sounds great. What a lovely sunshine smoothie!